DEBORAH POTTER, correspondent: It’s hard work on a warm day, but Bob Lewis never shirks. BOB LEWIS (Garden Volunteer): I garden at home. On off days, I’m out here. POTTER: “Here” is a vegetable patch in front of St. Luke’s Episcopal Church in suburban Washington, tended by volunteers from the parish. VOLUNTEER: We got a bumper crop and more coming in! POTTER: Last year, this garden was just an idea—something the rector dreamed up. REV. STEPHANIE NAGLEY (Rector, St. Luke’s Episcopal Church, Bethesda, Maryland): I think “come eat, go serve” is becoming our slogan. POTTER: For Reverend Stephanie Nagley, the garden as a way of living out what she sees as God’s call to give away what you’ve been given, especially in tough times. 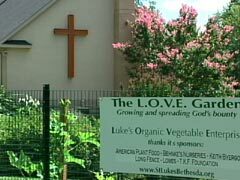 St. Luke’s is one of several churches across the country that planted vegetable gardens for the first time this spring, partly in response to the recession. Most of their food goes to local food banks, but what comes out of this garden goes right next door. All of the produce grown at the church is donated to St. Luke’s House, a mental health facility the parish helped to found almost 30 years ago. VOLUNTEER (to class members): You want to help us get all this stuff rinsed? POTTER: Cooking class is offered daily as part of a life skills program. The goal of the class is to help these adults with mental illness learn to live more independently. (to class member): What are you learning? CLASS MEMBER: How to cook different veggies. POTTER: The fact that those veggies come from the church next door isn’t lost on anyone at St. Luke’s House. BETH WELCH (Client, St. Luke’s House): I think it’s really absolutely nice. We get a lot more veggies to eat. MARK ROBBINS (Client, St. Luke’s House): I really appreciate it. I really should thank them sometime, I guess. ERIC GORDON (Staff, St. Luke’s House) I think the clients get a real kick out of it. One guy in particular is always double-checking: Are you guys really using that in your cooking classes? Are you sure? Yes, we definitely are using this in our cooking classes. POTTER: The clients and staff of St. Luke’s House benefit from the garden’s bounty, but that’s not its only value. Parishioner Anne Elsbree organized the 30 volunteers who tilled the ground, planted the seeds, and now harvest the crops. ANNE ELSBREE (Garden Organizer) I think it’s produced good teamwork at church. We’ve all been working on a project together and getting results, so it’s been very satisfying. REV. STEPHANIE NAGLEY: In some ways, I think a lot of this was just sort of an unconscious bubbling up of people’s faith, and now I think it’s sort of come to this next era, where it’s really now articulated, and we’re making it clear that this is what we’ve been about all along. POTTER: Cara Gonzalez worships at St. Luke’s and has brought the local youth organization she works with to help out in the garden. CARA GONZALEZ (Parishioner): There’s definitely something spiritual about working with the earth and feeling a relationship with all of God’s creation, and then taking that and making it into a human relationship with those who benefit in the cooking program and with the youth who benefit. I think it’s all about that connectedness, and that’s very spiritual. POTTER: This year’s harvest was such a success that St. Luke’s plans to keep the garden going next year and make it bigger, so it can feed even more people, body and spirit. CARA GONZALEZ (holding out fresh basil): Amazing. Here, take a sniff. Tell me that’s not spiritual right there. Amazing. For Religion & Ethics Newsweekly, I’m Deborah Potter in Bethesda, Maryland.